Do I Have to Quit Smoking Before Weight Loss Surgery? If you’re a smoker considering bariatric surgery, one of the things your weight loss surgeon will ask you to do is to try and quit before the operation. Smoking is linked with a wide range of serious health problems, including numerous types of cancer. Many obese individuals are already at a higher risk for certain cancers and other health-related conditions that are also linked with smoking, including esophageal cancer, stroke, and heart disease. 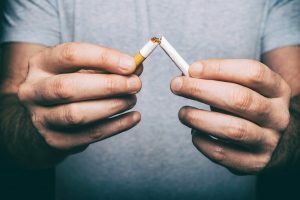 Additionally, smoking can lead to many post-operative complications, slowing the healing process and reducing the chances for weight loss success. At our practice, your care, safety, and results are our highest priorities. Therefore, we strongly recommend quitting smoking before considering any bariatric procedure. If you need help quitting, our skilled medical team can provide resources and advice to assist you in your efforts. Quitting is hard, but we can help. Give yourself the best chance to lead the healthy, happy life you aspire to. For more information, please reach out to our team.